I've been looking forward to my second Worldfest-Houston ever since I saw the Sci-Fi Shorts there last year. This year, I'm going to try to see a lot more, but it still won't be as much as I want to (in part because two sets of shorts I want to see will be screened against each other on Sunday!). According to the head of the short film jury, there were over 1,400 short films entered into this year's festival. That's a lot of entries! I love knowing that people are out there creating art and trying to make connections with viewers. Without further ado, here are my thoughts on tonight's screening of Animation/CGI Shorts. I wish I knew the technical terms for different kinds of animation (or that the Worldfest-Houston program book would list such things for the animated films). I'm not sure if I'm correct in this description, but this seemed to me like a stop-motion animation film using two-dimensional paper "puppets" or "cut-outs," as well as more sophisticated graphics as the film went on. 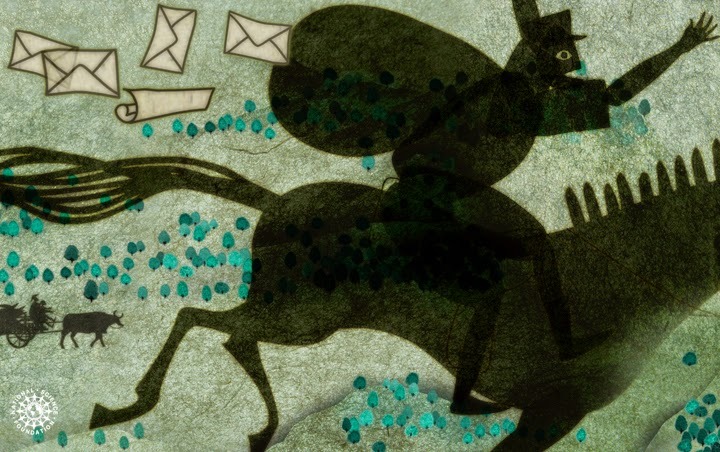 In any case, "Humanexus" presents a history of human communication, from cave paintings and the first alphabets up through the printing press, the Pony Express, telegrams, Morse code, telephones, and, of course, the Internet and personal devices. The film did a terrific job conveying how people were reacting to the technology, with no dialog until the point when the people stopped interacting with each other directly, and the questions "Is this what we want?" and "What do we want?" were repeatedly posed. The scenes then re-wound to a certain point and replayed at a quicker pace, leaving us at a place where we can have both connectivity without losing the personal interaction. This little film was highly polished and well-designed, and it's not surprising to me that it's won a number of film festival awards according to the film's website. I especially liked the way people were assaulted by and almost buried under e-mail -- I'm sure many of us can relate to that! It even incorporated the concept of cyberbullying, which is pretty darn relevant these days. 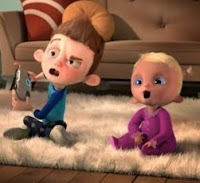 This short was adorable, and if this is student work, then the big animation studios certainly have a lot of talent to pull from in the future -- or maybe they should just be worried that their competition is going to get fierce! This short was full of humor and nerdy jokes, and it was incredibly professional. I didn't realize Brigham Young University had this amazing computer animation program. This film earned the program not only another Student Emmy for their collection, but a Student Academy Award as well. This was one of my two favorite films of the evening. It reminded me of Wall-E as done by Tim Burton, yet with a style of its own. 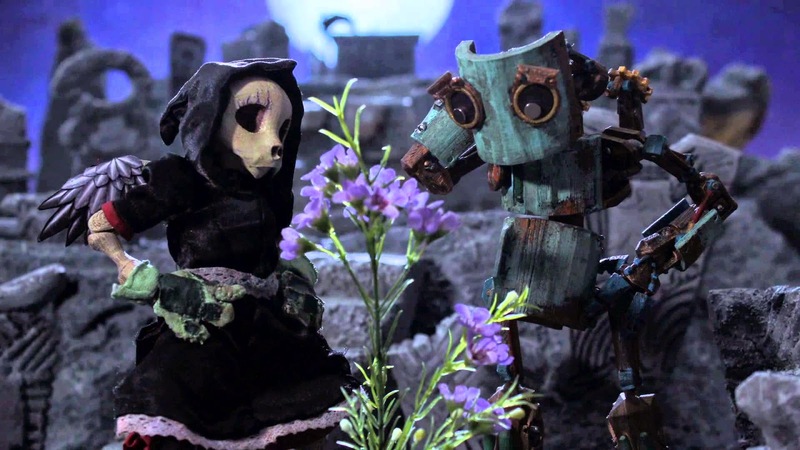 A female Angel of Death sits lonely in a barren graveyard, while a robot grows and waters flowers in an underground greenhouse, but ultimately they're both moved to venture out of their safe havens and find each other. The robot teaches Death to wear gloves when tending the flowers so as not to kill them with her touch, and he contemplates going back to his greenhouse as his power supply wanes, but can't bring himself to leave his new friend. I'm not embarrassed to admit that this lovely story made me cry, and the animation was exquisite, especially in how well it portrayed these non-traditional characters' emotions. This one is from the University of North Carolina's School of Filmmaking. I found this film a little harder to relate to, but I absolutely would give it an A+ for originality and creativity. The program description notes that humanity may only be a memory in the future, but three figures from a needlepoint pillow come to life and learn to harvest what's left. 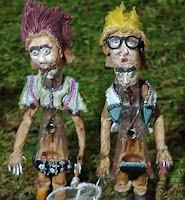 We learn that these are the Clothespin Freaks, named Pelvis Catcher, Brain Grabber, and Foot Licker, respectively. They assemble new skeletal creatures out of these particular body parts (pelvic bones, brains, and feet), all the while observed by two birds. I'm not entirely sure what the audience is supposed to take away from this, but the beauty of short films is that they can be vignettes, and they can be experimental. And I did enjoy watching these odd creatures at their odd work. This film, "The Oceanmaker", was the other of my two favorites of the evening. 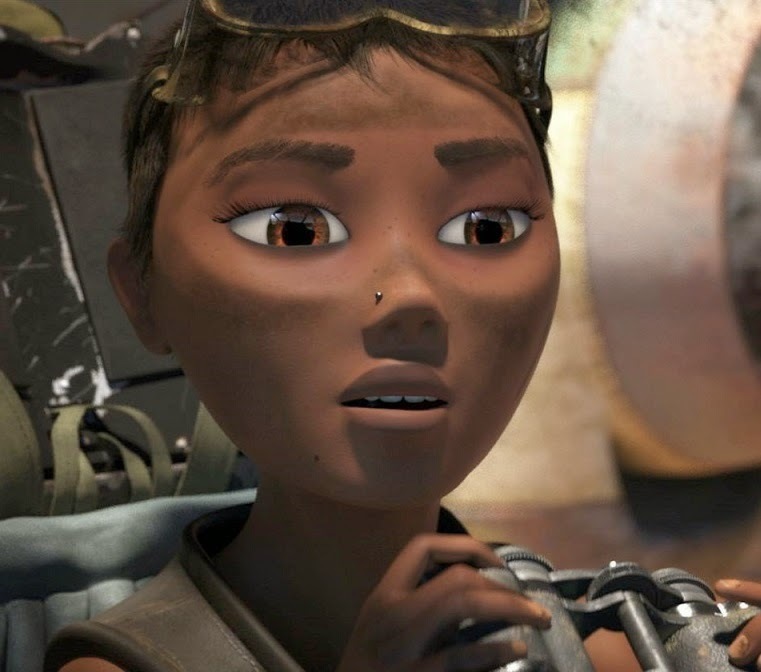 The program tells us that after the seas have disappeared, "a courageous young female pilot fights against viscious sky pirates for control of the last remaining source of water: the clouds." But as with my other favorite, "Death and the Robot", the story was told so well that no description was necessary to understand exactly what was happening. The animation, presumably CGI, was gorgeous, with haunting imagery of boat "bones" half-buried in the sand, an aircraft carrier, a lighthouse, and even a half-submerged submarine surrounded by makeshift windmills. The desert, mountains, and clouds were amazing, not to mention the planes. And even that area in which computer animation can so often fall down, human faces, was terrific. I got a sort of steampunk Mad Max feel to this as the pilot tried to seed clouds with her Rainmaker technology, only to be fired upon by the sky pirates who would rather collect the water vapor only for themselves. This one made me cry too. That's not to say short films have to make me cry to be my favorites; it just happened to work out that way this time. 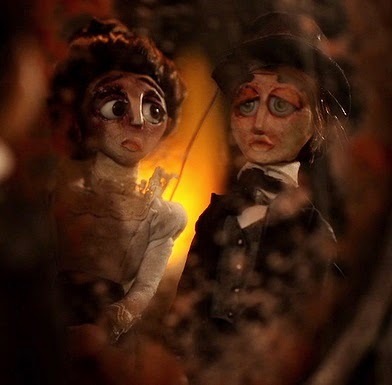 In this short, two marionettes come to life and dance together to the music of an old Victrola, until one night when Lars becomes tempted by the mirror he discovers in their attic home. My favorite aspect of this film was the visual style, and the story reminded me a little of the feature-length animated film Coraline, about those "grass is always greener" alternate worlds. I especially liked Lars and Luna's expressive eyes, which in his case became very creepy indeed. This film managed to pack quite a wallop for being less than four minutes long. Here's another case where I wish I knew what to call the technique: film of live actors was processed to give it a surreal feel, especially as the people were placed on cartoon streets lined with cartoon buildings. The story is simple: this alternate modern-day Germany has a new Chancellor who controls all information, but he says it's okay because he just wants everyone to be happy. A young man tries to warn people, but they don't see or hear him. In my mind, this can be viewed as a commentary on not only governmental control of information, but also corporate control. This film was extremely sophisticated but a little confusing in parts. 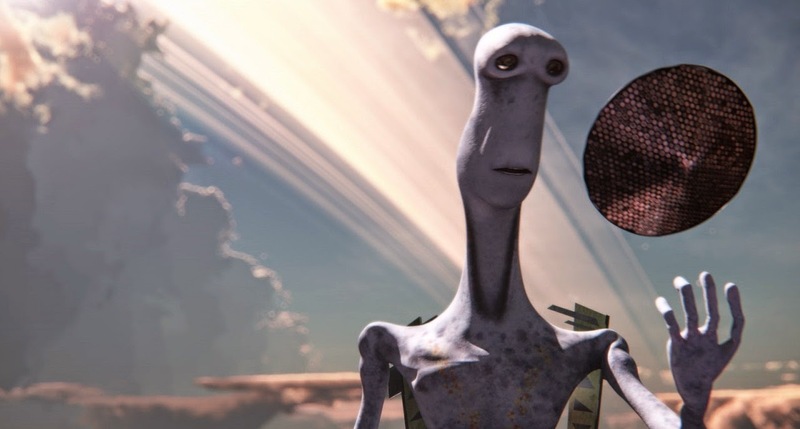 Well, not exactly confusing -- we know that one young alien belonging to a group that engineers the universe has his own ideas, which don't necessarily correspond to the laws of physics as we know them. A textual prologue at the beginning of the film indicates that the Earth's moon is so large that we're really our own "double planet" system, something that would very rarely evolve naturally. So I interpreted this to mean that the character, whose name I think was Lufo, was responsible for giving Earth the moon it has. What wasn't clear to me was exactly what Lufo was doing to the moon. I think he was creating the dark maria (seas) by using his jackhammer-like tool to allow the darker material to come to the moon's surface in various areas, and that he towed the moon to where he wanted it, having foreseen that it would help life on Earth evolve. But I wasn't sure which was the looking planet: the Earth or the moon. And I actually thought that Lufo was a child at first, since it seemed his mother was talking to him as one, but then we see that he is physically as big as the others around him. I also found the characters' vocal inflections strangely flat most of the time. It can be argued that they're aliens so they wouldn't talk like us, but most of their other traits were very, very human. These are minor quibbles, though; overall the film was visually gorgeous (lots of planetary rings, plus Jupiter, my all-time favorite planet) and quite humorous, but with the message that artistic expression is important no matter who you are. The last film of the evening was the longest and was mostly live action, so it had the least percentage of animation -- but what animation! In a post-ecological-disaster world, a man trained as a Tracker, or one who studies the balance of nature, abandons his training when his daughter dies. Years later, he is tempted back out from behind the city walls by a profiteering friend who wants his Tracker experience to guide them to the possible source of a plague, which he thinks will make them rich. Much of the animation in this film consisted of tiny creatures that evolved to feed upon the toxic materials poisoning the waters, as well as insects that look like but clearly aren't butterflies. The size scale increases dramatically as the man nears the source of the plague and has to face it one on one. In my mind, the animation, special effects, and even the general cinematography were on par with the brilliant film Pan's Labyrinth. "Dust" also reminded me of the books The Girl with All the Gifts by M.R. Carey and Annihilation by Jeff VanderMeer, but the story still feels original. Oh, and it was also very well acted, particularly the main character. Whew! I'm looking forward to seeing lots more short films later this week. For information on Worldfest-Houston, go here. 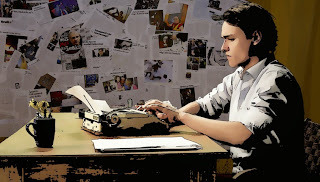 And click here to see my other reviews of Worldfest-Houston short film screenings.